2014 Volkswagen CC R-line review | What Car? The VW CC has been a standalone model for over two years now. However, the Passat saloon on which it's based is about to be replaced, so the brand has introduced a new R-line trim to give the CC added appeal in the face of newer rivals, such as the BMW 4 Series Gran Coupe. Two engines are available in this new range-topping trim – one petrol and one diesel – and both come with the choice of either a six-speed manual gearbox or a six-speed DSG automatic (which adds £1480). The R-Line also adds a generous sprinkling of standard equipment, which includes a sportier-looking body kit, xenon headlights – with LED daytime running lights – 18-inch alloys and a redesigned front grille. Prices start at £29,670 for the manual petrol version, which is £650 more than the existing GT model. However, the majority of CC buyers are company car users looking for reasonable running costs, so the 175bhp 2.0-litre diesel we're testing here is far more relevant. This starts at £30,205. 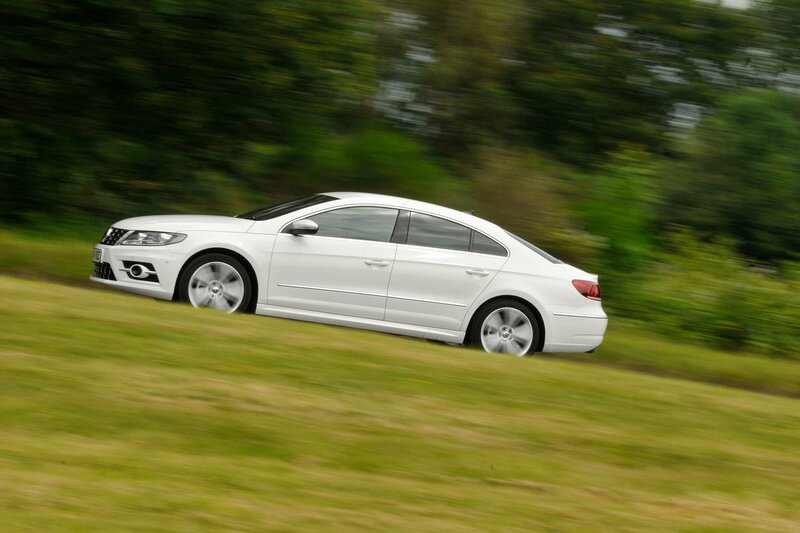 What is the 2014 VW CC R-line like to drive? The CC is at its best when you drive it in a smooth, unhurried fashion. The diesel engine pulls strongly from low revs, and the steering is light but accurate enough to provide plenty of confidence. The R-line model comes with adaptive dampers as standard, which can alter the stiffness of the suspension at the touch of a button. Left in the more benign setting, it does a reasonable job of smoothing over bumps in the road. The CC feels stable and cosseting at high speed, too, making it an accomplished motorway cruiser. Around town though, sharp-edged potholes can really catch the CC out, sending shudders through the cabin. As a result, the Sport setting is best left alone, as it adds little to the dynamic package except an even firmer ride. Our car came with the optional DSG auto gearbox, which is relatively smooth and helps you stay in the engine's broad power band. Even in Sport mode it never hangs on to gears for too long, either. The CC comes with laminated side windows as standard, so although the diesel engine can become quite gruff when you accelerate, there isn't too much other noise filtering into the cabin. There is some road noise, however. What is the 2014 VW CC R-line like inside? More or less unchanged. The R-Line has a different steering wheel and logos dotted about the cabin – on the brushed aluminium inserts and leather seats – to remind you that you're driving the range-topping version. You sit relatively high up by saloon standards, but there's a wide range of adjustment in the part-electric seats, so it's easy to find a comfortable driving position. The heated leather seats are supportive, holding you firmly in place without becoming uncomfortable on longer journeys. The dashboard is as neat and simple as ever, but the infotainment touch-screen is one area where the CC is starting to feel a bit old. There are handy shortcut buttons either side of the screen, but they are quite small, and the menus and graphics are not as slick as the latest system in the new Golf, let alone the kit you'd find in premium rivals from Audi and BMW. Those travelling in the front will find no shortage of head- and elbow-room, but you pay the price for that sleek roofline in the back, where anyone approaching six feet tall will find their head resting on the roof lining. There is a narrow middle on the back row too, but it's really only for very occasional use. For carrying luggage though, the CC is still pretty practical. There is a sizeable lip in the boot, but the load bay itself is flat, wide and square, and the standard split/folding 60:40 seats boost practicality further. It's not the deepest boot in the world, but it's on a par with other saloons in this class. Standard equipment (as you would probably expect when spending £30k on a VW) is generous, and the CC R-line comes with almost everything you could possibly need. Climate control, sat-nav, Bluetooth, DAB digital radio, a USB port, automatic lights and wipers and leather upholstery are all standard. For company buyers with restrictions about adding optional equipment, this is ideal, but if you really want to splash out then you can add extra toys such as a DVD player and hard drive, adaptive cruise control, keyless entry and start, and a reversing camera. As a well-equipped company car, the CC still has some appeal. It's relaxing to drive and (on the motorway at least) a comfortable long distance cruiser. This range-topping R-line adds little that wasn't already present in the GT version, though, so we can't really see any reason to spend the extra. Rivals like the BMW 4 Series GC and Audi A5 Sportback both come less well equipped at this price, but also have much more efficient engines to choose from and are sharper to drive than the ageing VW.